Not all spirulina tablets are created equal. Spirulina is well known to vary a good deal with the quality of the environment in which it is raised. With this in mind, I’m going to review Nutrex Spirulina Tablets. 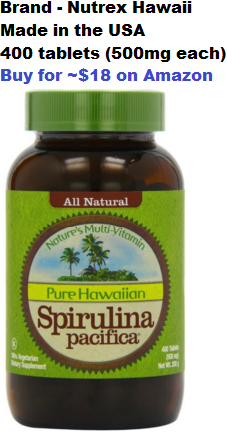 It is a must to purchase spirulina from a quality source. And if you have read any of my other Nutrex Hawaii spirulina reviews you know that I support this brand. Why? Because they put a lot of effort in growing and selling high quality spirulina that is just about as clean as it could possibly be. Being that Nutrex Hawaii is in the USA, they are subject to inspections from several different government agencies. This is one of the great things about USA production. All the regulations that Nutrex Hawaii has to meet assures quality and safety of their product. So what agencies are they regulated by? Nutrex Hawaii is regulated by the FDA, the State of Hawaii Department of Health, the US Department of Agriculture, and the Federal Trade Commission (FTC). With all these government agencies on their back it you know they walk a straight line. These agencies don’t mess around. They can shut businesses down, order the recall of products, and so on. And to add to the quality assurance, Nutrex Hawaii’s facility is also GMP (good manufacturing practice) certified, which is determined by the FDA. One thing I read that caught my attention is that Nutrex Hawaii has a pipeline that goes down 2,000 feet into the pacific ocean. They pump water out from the whole way down there to supply the spirulina with plenty of minerals and all 94 trace elements! Its kind of ridiculous, but wow. What other companies that sell spirulina go through such great lengths for the sake of added nutrients? This is about as good as it gets. Heck ya. Its herbicide-free, pesticide-free, gluten-free, lactose-free, and is vegan and non-GMO project verified. Its nature at its finest. Also, not only is it free of pesticides/herbicides, but it is also free of industrial pollutants. This is due to the area in which it is grown which happens to be a biosecure zone on the cost of the big island of Hawaii. Ok so the spirulina is good quality but what about the taste? I know you all are wondering this. You are probably looking to buy the tablets because spirulina tastes pretty horrible and you don’t want to taste a thing. With some tablets you can still taste the spirulina and thats not what you’re looking for. Luckily these tablets are good quality. I don’t know what the are coated in but I guess they have to be coated in something to mask the taste/smell right? Are Nutrex Hawaii’s spirulina tablets worth it? That all depends on what you are willing to spend. They are a bit pricier than some other spirulina tablet products out there but I would say its worth it. The cheapest place to buy is one Amazon.com for right around $18. And thats 400 tablets that are 500mg each. Since the serving size is 6 tablets this bottle will last you 66.7 servings. $18 isn’t a bad price for that amount, especially for the quality. If you have tried a lot of other spirulina products out there then you should be able to notice the quality of this product. Just by looking at it you can tell its better quality than others. It just has a very deep, rich green look. Without a doubt its top quality. Still unsure if its good enough?